17-50mm f/2.8 OS HSM (DX) — This is a smaller and better option than Nikon’s 17-55mm f/2.8 DX lens for all the crop sensor users. The US$100 off now active represents a 15% savings, making it a reasonable US$570. This is a lens Nikon should be making for DX users, but isn’t. 50-150mm f/2.8 OS HSM (DX) — It’s a pity that this lens grew in size so that it’s not that much smaller and lighter than the 70-200mm lenses, but it’s still a good choice for certain DX chores because the focal length is more conducive. For example, in indoor sports work, 70mm on DX is usually just too much at the wide end so the 50mm of this lens is a better choice for DX users. At US$150 off the lens is now US$950. If you really have to have a 70-200mm f/2.8 (DX or FX), then Sigma’s version of that is now US$1250. So unlike Nikon, Sigma is giving DX users a choice of how to proceed with telephoto zoom. 85mm f/1.4 HSM (DX or FX) — A very good lens, now US$75 off at US$894. That said, my preference has been the Nikkor 85mm f/1.8G if you’re looking for a lower cost fast moderate telephoto prime. Still, f/1.4 is f/1.4. If you need that, the Sigma is far less costly than the equivalent Nikkor and pretty much holds its own against that optic. 180mm f/2.8 OS HSM (DX or FX) — Nikon simply hasn’t updated the 200mm f/4 Micro-Nikkor, and even if they did they’d have a difficult time matching this optic. If you need working distance in macro, I’d say that this is currently the best choice available, though it’s a very pricey US$1550 after the new US$150 rebate. 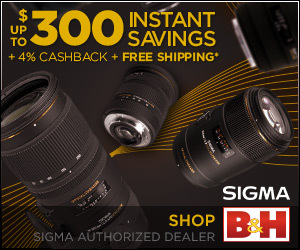 Other Sigma lenses are on sale, too, but those five would be my choices of lenses to look at again with the new rebates in place.